Tibvrtini Extra Virgin Olive Oil is a unique olive oil from Lazio the ancient land of Villa Adriana dating back to 135 AD. Tibvrtini olive oil is non-filtered organic oil. The olive varieties that give Tibvrtini olive oil its distinct delicate & complex flavor include Bronanica, Montanesy, Oliva Dolce, Romana, Carbonocella & Rosciola. Tibvrtini olive oil has a fresh flowery olive flavor with a clean buttery almond opening, to grassy tones, a long finish ending with slight pepper. 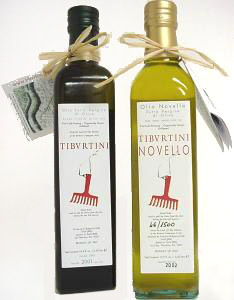 Tibvrtini "New oil" Novello available in December is the fresh, first new olive oil from the presses of the harvest, air-shipped directly from the mill to your table. Tibvrtini extra virgin olive oil, Olio Novello is iridescent, dense & alive with the taste & aroma of freshly pressed olives-existing in this state before it settles into the fine olive oil known above as Tibvrtini. Enjoy it now, drizzled on winter vegetables, fresh fish or seafood, bruschetta, salads, or as a brilliant finish to anything fresh. Only 1500 bottles of Tibvrtini Novello are produced. Tibvrtini Extra Virgin Olive Oil & Tibvrtini Extra Virgin Novello (Lazio). Tibvrtini Extra Virgin Novello Olive Oil.